TERROIR (in collaboration with Marie-Louise Holst) has won a prize in the international competition for a new Natural History Museum in Copenhagen's historic Botanical Gardens. TERROIR’s scheme was based upon the cellular nature of the Botanic Garden as it is currently organised. A series of bulbs are literally "planted" below the surface and merge together to create a diverse range of gallery and storage spaces. The extraordinary collection held by the new institution is archived on the lower level, allowing glimpses down to the collections from exhibition spaces above. The TERROIR scheme challenged a major rule of the competition, which required the new project to be completely underground. Our proposal suggested that one or more of these "bulbs" might grow above the ground level to provide café and entrance facilities and also to create a new glass spire. 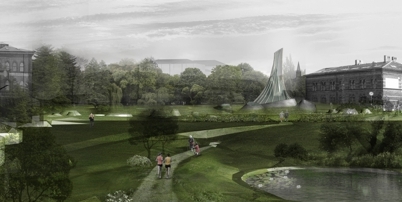 This iconic, slender spire would complement the existing spires which dot the Copenhagen skyline and announce the institution across the city. Despite this radical suggestion, the project was awarded a DKK100,000 special award for the quality of the exhibition space proposed. TERROIR now hope to be short-listed for the next phase of the project next year. The awards ceremony was held in Copenhagen on Thursday, November 5 with Camilla Jensen from TERROIR in attendance to accept the prize. The ceremony was opened by the Director of the Natural History Museum, Morten Meldgaard with a welcome speech from the Danish Science Minister, Helge Sander. Prizes were awarded by members of the jury including Professor Malene Hauxner from Copenhagen University, Thomas Bo Jensen (Architect) and the Director of the Lousiana Museum of Modern Art, Poul Erik Tøjner. To see more information on the scheme, click here. You can also see the project featured on the Australian Design Review site. Terroir har vundet en pris i den internationale arkitektkonkurrence ”Statens Naturhistoriske Museum” i Botanisk Have, København. Overrækkelsen af præmierne finder sted Torsdag d. 5. November, hvor Camilla Jensen fra Terroir København vil være tilstede og modtage prisen. Ceremonien blev åbnet af Statens Naturhistoriske Museums direktør Morten Meldgaard, med en velkomsttale af Videnskabsminister Helge Sander. Vinder forslagene blev præsenteret af fagdommerne Malene Hauxner, Professor Københavns Universitet, Thomas Bo Jensen, Arkitekt MAA og Poul Erik Tøjner, Museumsdirektør, Louisiana Museum of Modern Art og overrakt af Videnskabsminister Helge Sander.